The pharmaceutical industry must respond to increasing pressure to rapidly develop cost-effective, fairly priced medicines. New business models must be adopted to leverage the massive amounts of data generated across the pharma/healthcare continuum. Pharma companies must also pursue new collaborations to enable optimal digital workflows that provide maximum efficiency and productivity. 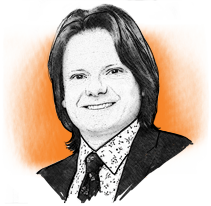 Tradition can add real meaning to our personal lives, but, for many businesses, holding on to traditional practices can inhibit much-needed progress. This is certainly true in the pharmaceutical industry, which faces tremendous pressure on many fronts. Only those companies willing to replace historical traditions with new ways of operating — on the manufacturing floor and in the digital world — will evolve to meet the needs and expectations of all future stakeholders. Those stakeholders — governments, insurers, physicians and patients — no longer accept whatever products drug makers choose to offer at whatever price they set. Armed with readily accessible data and support from advocacy groups and others through social media networks, patients are deciding which drugs are most valuable. They also expect to be included in the drug development process. Their desires are in line with those of regulators, who are beginning to include patient concerns and opinions in the drug approval process. New drugs are expected to exceed the efficacy of existing products and provide measurable, real-world value: addressing unmet medical needs, enhancing quality of life, extending lifetimes and improving patient adherence. With this move to value- and outcome-based pricing, stakeholders are balking at rising prices. Insurers are demanding discounts and price protection in their formulary contracts. New drugs that carry hefty price tags are being protested by physicians, patients and insurers. Overall, public perception of the pharmaceutical industry has reached a low point. Drug development, however, continues to be a lengthy, complex and expensive process. In addition, the durations of patents and market exclusivity are shrinking, at a point when branded drugs face growing competition from generics and biosimilars. Clearly, the traditional business model is no longer sufficient. There is hope. Drug manufacturers today have access to vast quantities of data generated throughout the healthcare ecosystem, from the results obtained from fundamental research projects to data generated in preclinical to late-stage clinical trials and post-marketing studies, not to mention the patient information documented in electronic health records (EHRs). 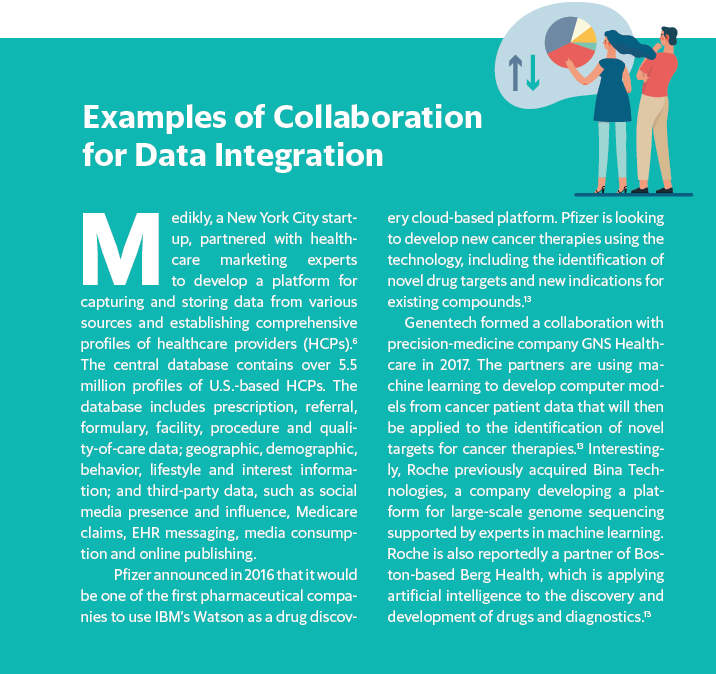 Additional data on patients and patient populations comes from a number of sources, such as vendors, collaborative research partners, insurers and patients that freely share their information. EHRs generated during routine doctor visits contain demographic and other personal information, insurance-related medical and pharmacy claim data and data generated during treatment or from monitoring devices. The scope and format of this data vary internationally because it is generated by many different sources, including primary physicians, emergency rooms, inpatient hospitals, insurance companies and even social media platforms.2 In addition, it can change over time as technologies and policies evolve. To realize the opportunities presented by the avalanche of data available today, pharmaceutical companies must move away from this traditional siloed approach to a new business model that enables data sharing within the enterprise and with other stakeholders and encourages consideration of real-world performance from discovery through commercialization. The data in EHRs, for instance, can be used for much more than enhancing patient care.5 They can provide data for post-marketing, registry-based randomized studies and comparative effectiveness studies. Drug utilization, epidemiology and safety information can also be obtained from EHRs. Data can be applied to establish more effective hypotheses, parameters and endpoints for clinical trials and facilitate patient recruitment and potentially to populate electronic case report forms (eCRFs). EHR data can also be used to identify possible new indications for existing drugs. Integration of data generated during discovery and development with post-approval study results and patient records is equally essential for pharmaceutical companies from a business perspective.8 Accelerating the development of cost-effective drugs that provide measurable value is fundamental and can only be achieved by leveraging the myriad data sources to more rapidly identify drug candidates with the greatest likelihood to provide real-world performance. However, data integration is a challenge for most pharmaceutical companies. Protection of patient privacy (and the associated legal issues) can be a significant hurdle for some firms.6 A deficiency of staff with the training and expertise required to implement and manage comprehensive data integration and management platforms is another. In many cases, data are still collected manually. Perhaps the biggest challenge is the fact that the disparate types of data are generated and maintained in different locations by different groups that have not historically communicated with one another.9 Structured and unstructured information on different diseases, drug candidates, formulations, dosages, preclinical results, clinical trial results and patients are stored in different databases.9 When drug manufacturers collaborate with academic researchers, insurers, physicians, advocacy groups and other organizations, the complexity of data integration — and security risks — increases dramatically. Most pharmaceutical companies are taking steps in the right direction. 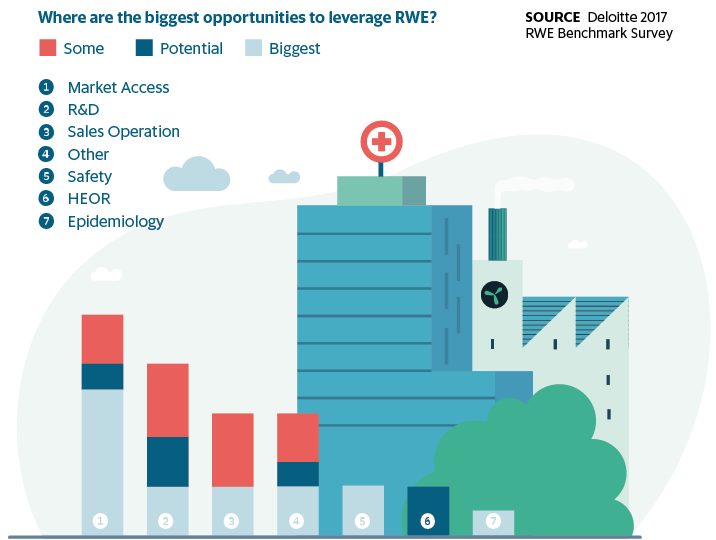 According to the results of Deloitte’s 2017 real-world evidence (RWE) benchmark survey, the use of RWE in many different applications is increasing, with over 50% of respondents investing in RWE programs to improve R&D efforts.10 The survey also revealed, however, that there is a need to access the right real-world data, which may require the establishment of new types of partnerships. One encouraging result was the interest shown by respondents in investing in new technologies that impact workflows and increase efficiencies — perhaps representing initial movement toward new business models. IBM’s Watson cognitive computing technology is one such technology being embraced by several pharmaceutical companies for a number of different applications. IBM has configured a version of Watson to specifically support life science research through incorporation of medical literature, patents, genomics and chemical and pharmacological data. Cognitive solutions are attractive because they are specifically designed to integrate and analyze big data sets and can be “trained to understand technical, industry-specific content and use advanced reasoning, predictive modeling, and machine learning techniques.”12 Watson has been used to accelerate drug target identification and drug repurposing projects. Numerof, Rita. “The Role of Post-Market Studies in Market Access.” eyeforpharma. 19 Jul. 2017. Web. Banerjee, Amitava, David Mathew, Katherine Rouane. “Using patient data for patients’ benefit,” BMJ; 358:j4413 (2017). “Big Data for the Pharmaceutical Industry.” Informatica. 2013. Web. Keshava, Nirmal. “Opportunities for Data Science in the Pharmaceutical Industry.” IEEE Pulse. 17 May 2017. Web. Cowie, Martin R., et al. “Electronic health records to facilitate clinical research.” Clin Res Cardiol. 106(1): 1–9. (2017). Patel, Ritesh. “Data, Marketing, and the Pharmaceutical Industry.” Pharma VOICE, Sept. 2016. Web. Cassese, Vita. “Delivering Value from Data Analytics.” Pharmaceutical Executive, 2 Mar. 2018. “21st Century Pharmaceutical Collaboration: The Value Convergence.” Price Waterhouse Cooper. Jul. 2015. Web. Palgon, Gary. “The Pharmaceutical R&D Process and the Inherent Data Challenges.” Liason. 7 Apr. 2017. Web. “Getting real with real-world evidence (RWE): 2017 RWE benchmark survey.” Deloitte. n.d. Web. Marwaha, Sam, Michael Ruhl, Paul Shorkey. “Doubling Pharma Value with Data Science.” Boston Consulting Group. 9 Feb. 2018. Web. Chen, Ying, Elenee Argentinis, Griff Weber. “IBM Watson: How Cognitive Computing Can Be Applied to Big Data Challenges in Life Sciences Research.” Clinical Therapeutics. 38: 688-701 (2016). Sennaar, Kumba. “AI in Pharma and Biomedicine – Analysis of the Top 5 Global Drug Companies.” Techemergence. 1 Feb. 2018. Web.